For those not familiar with this series I pick out mainstream products mentioned in Favourite videos and suggest Green Beauty Swaps for them. NARS Tinted Moisturiser – I use tinted moisturisers on a daily basis and my current favourites are Madara Moon Flower Tinting Fluid and JOIK BB Cream. 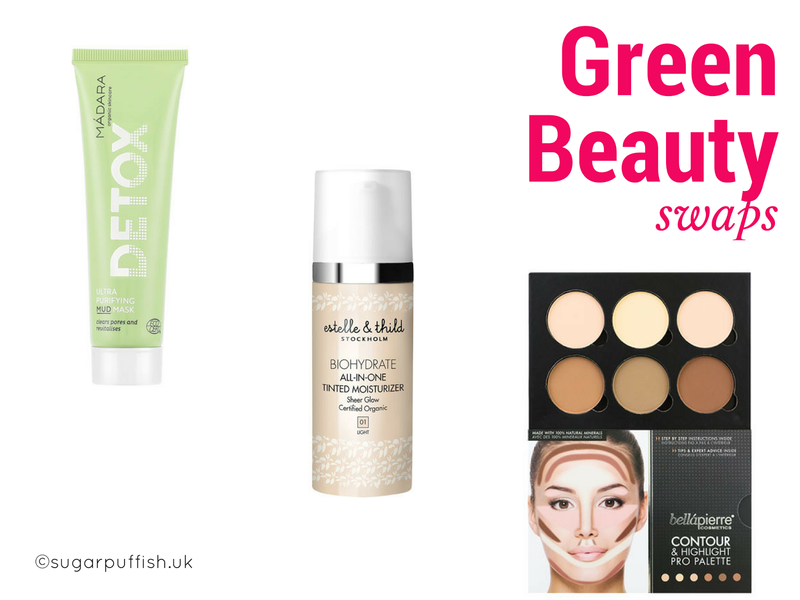 Other alternatives are Dr Hauschka Tinted Day Cream, Estelle & Thild All-in One Tinted Moisturiser and Green People Age Defy SPF 15 DD Tinted Moisturiser. Bobbi Brown Bronzer - I struggled to track down ingredients online so I suspect the worst with this brand. Green Beauty Bronzers are quite easy to find and there are brands to suit every budget. Check out Ere Perez, Inika, Bellapierre, Lavera and W3LL People. Dior Sugar Lip Scrub – I am astonished that anyone would spend £24 on a lip scrub, you really are just buying into a label. Lip Scrubs are easy to DIY from the contents of your kitchen cupboard. Simply use caster sugar with olive oil or coconut oil or honey. I guess the benefit of the Dior scrub is it's portable and not messy so you could swap for ILIA Balmy Nights. GlamGlow Supermud – you might be surprised to spot these on my swaps but there are some undesirable ingredients in the Glam Glow range (e.g. mineral oils & Methylisothiazolinone). My first thought as an alternative is the Madara Ultra Purifying Mud Mask but there are many others I'd recommend such as Odylique 3 in 1 Maca Mask, Botanicals Balancing Detox Mask, Evolve Raw Cacao & Coconut Radiant Glow Mask. The Body Shop Almond Milk & Honey – I’ve seen this range recommended for sensitive skin prone to eczema and it doesn’t sit well with me. To promote a range as almond and honey when those ingredients are very low down on the list feels like a rip off. This range contains possible eczema triggering ingredients like parfum and other undesirables. Also “almond milk” is interesting phrase for what is actually almond oil. I can't find you an exact swap but Weleda and Dr Hauschka have an almond range. Many Green Beauty lovers will just use almond oil and honey by themselves. Starbucks Iced Black Americano – when I saw a blogger recommend their favourite coffee it got me thinking, if you’re a regular customer have you considered switching to a reusable cup to cut down on landfill waste? According to the latest statistics, the UK throws away around three billion disposable cups a year. The problem is many disposable cups can only be recycled at a handful of specialist places (its polyethylene which waterproofs them that causes problems) so majority end up in landfill. If you'd like to help the planet then take a look at Ecoffee Cup for stylish designs. I love posts like these. They're great for anyone not sure where to start when switching to green beauty. (I love the Dr Huaschka Bronzer)!